What’s the most essential personality trait of sailors? Resilience. Racing against the clock and everything Mother Nature can throw at them means they must be resourceful, tireless and creative. During the recent Newport to Bermuda Race competitors exhibited all of these traits. When a bottom bearing on the rudder of the Taylor 41 Wandrian broke half way into the race, the crew jumped into action and fashioned a secondary dam out of two bailing buckets. Fellow competitors aboard the Black Watch shadowed Taylor 41 along the remainder of the course to Bermuda just in case the dam broke. Both boats made it safely to the finish line. The durable Sunbrella fabrics on the Rhode Yacht Airstream trailer have the same resilience when it comes to everything our road trip through New England will throw at them. 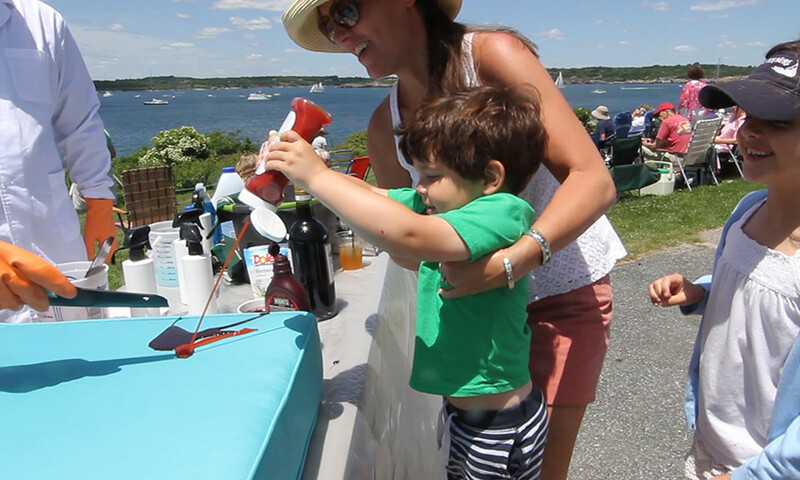 For years they’ve proven they can withstand sun and salt aboard many a sailboat, and most recently they bested red wine, ketchup, chocolate syrup and blueberry topping in our stain challenge. But who will come out on top when Sunbrella duels with two elementary-school-age sisters armed with winner-take-all attitudes and food that makes most parents banish their children to the kitchen?